Been following crowdfunding for a while now and fascinated by the whole model and how it can be used to test the most minimum of minimum viable products. Some how ever are starting to stretch credibility with whether they will ever produce the products that they have ideated. Coin for example has in interesting idea to consolidate your credit cards into one. They are currently looking to raise about $50,000 to get into production. But they are far from having something that you can use. It’s a neat idea, but perhaps too early in the early funding stage. A local Toronto developer and friend, Craig Walker, recently decided to give crowd funding a try for his own project. 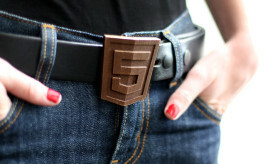 He has been an avid 3D enthusiast for many years and created a 3D printed HTML5 buckle. Based on the feedback he received from his 3D printed version, he started looking into what it would cost to produce the buckles at larger scale. To overcome the startup costs and also just to see if he could generate interest he started a campaign on kickstarter to raise $5,000. It came down to the final hours, but he succeeded and raised the money and is now going into production and is hoping to have his first batch of buckles out before Christmas to early supporters. After his campaign ended there were a number of people who were still interested in buying and he has now setup a shopify site to take further orders. Go check them out! For only $25 you are supporting a local developer, crowd funding, open source and of course your pants! Congratulations to Craig! Love to hear about any other personal crowd funding stories. Contact us and tell us about it!